The name Slavonia derives from the Latin “Sclavonia”, which was a term for Slavic settlements in the middle ages. Slavonia belonged to the Kingdom of Croatia-Slavonia until 1918 which was part of the Austro-Hungarian Monarchy. In the 16th and 17th century, Slavonia was conquered by Ottoman troops. They occupied land and settlements alongside Danube and Sava. During the occupation, Slavonia’s trade contacts with other Croatian regions ended. The freeing of Slavonia from the Ottomans began after the defeat of the Turks near Vienna in 1683. After the Peace of Karlovci in 1699, Slavonia was free again and most of the region fell to Austria. Many settlements and their population had been uprooted during the Ottoman Rule. Maria Theresa and Josef II thus recruited peasants and craftsmen from German regions to Slavonia. After the Treaty of Trianon in 1920, Serbia, Croatia and Slovenia founded a new state – Yugoslavia. After World War II, Slavonia went to the newly founded state of Croatia. Slavonia should not be mistaken for Slovenia. Slavonia offers a rich landscape with rivers, fields, vineyards and mountains. The Rivers of Sava, Drava and Danube went through the historical region of Slavonia in today’s eastern Croatia. The German settlers entered the region on the Danube. 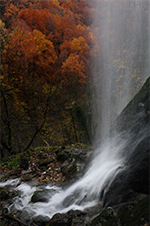 The fertile land, thick oak woods and the waters rich in fish attracted many people at all times. Slavonia is known as a fertile region and for a cultural diversity which is unique in the whole of Croatia. Over 2000 types of plants and animals can be found in the water meadows, marsh and woods of Slavonia. Over the centuries, many people benefited from the diversity of the region. The area of the Pannonian Basin is characteristic with its wide fields, many rivers, flooded zones and old woods. Already the Romans used the good agricultural conditions of Slavonia for growing wine. Graievina, Chardonnay, Silvaner and Zweigelt are only a few of the grape varieties grown in Slavonia. Furthermore, Slavonia is known for breeding the world-famous Lipizzaner. The animals were the pride and joy of the Habsburgs and bred them in Slavonia from the 18th century onwards. 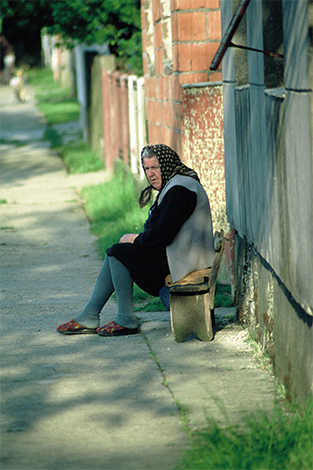 An old woman from Velimiravac is enjoying the midday sun. 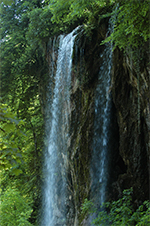 Slavonia is rich in old woods with brooks and waterfalls.